I wish that someone had told me that it’s all about the joy of creativity and striving for perfection. Our culture is all about creating excellence, and it’s exciting when everyone buys into that idea and is passionate about what we do. We’re able to cook with some of the most incredible ingredients from around the globe, and creating amazing food, day in and day out, is a real joy. I had the pleasure to interview Chef Tyson Cole. of Loro. Loro is an Asian smokehouse and bar brought to you by James Beard Award winners Chef Tyson Cole and Aaron Franklin with a menu featuring grilled and smoked meats, sides, craft beer and batch cocktails. You can order food at the bar and sit in the warm and expansive indoor space or outside on the porch shaded by a canopy of hundred-year-old oak trees. The much-anticipated restaurant is a part of Hai Hospitality, the restaurant group that counts Uchi and Uchiko in Austin; Uchi in Houston; Uchi and Uchiba in Dallas; and Uchi in Denver among its concepts. This is Aaron Franklin’s first restaurant venture outside of his acclaimed, award-winning Franklin Barbecue in Austin. 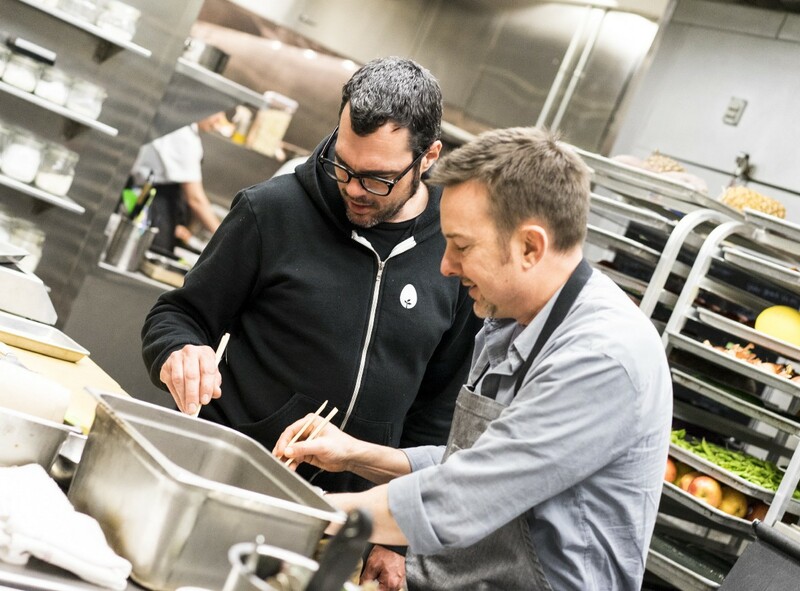 The Loro menu was created by Chef Tyson Cole and Aaron Franklin with the Loro team to offer a variety of dishes that balance Southeast Asian flavors with the rich texture of traditional Texas BBQ. Thank you so much for joining us Tyson. What inspired you to become a chef ? A job in college at a Japanese restaurant led to me falling in love with Japanese hospitality, the food, and later sushi. What has your journey been like since first stepping foot in a kitchen? Inspiring. The ability to create through food is such a gift, and guests pay for you to do it. But for sure long days and nights of work for over 15 years. Do you have a specialty? If so, what drew you to that type of food? Yes, sushi. Working at a Japanese restaurant, watching sushi chefs interact with guests and carve up bites with their knives… It entranced me and I dove in head first to try to become a sushi chef from there. It took 10 years and four senseis before opening our own place Uchi. Can you share the funniest or most interesting story that happened to you since you became a chef? Yes, how naive I was at 33 when we opened Uchi in 2003. I fought hard to not have valet, not have a walk-in cooler, and to be closed on Sundays. Come to find out, all three of those things are the opposite now, and no doubt helped with Uchi’s eventual success. My partner Daryl Kunik’s hard work, tenacity, and vision were key to that foundation. Every chef needs a great partner to succeed. Its yin and yang. Left brain, right brain. Growing people’s lives through organization… leads to more chances for generosity. True success is in people, and that generosity leads to grace. What failures have you had along the way? How have they led you to success? Lots of failures in food, concepts, and dishes. You can’t know success without failure. Example: every dish we make, the first version is rarely as good as the second version, and so on. The beauty of cooking is that we get so many chances. Yes, we just opened our Asian smoke house Loro in Austin this past Spring, and an Uchi in Denver last month. What advice do you have for aspiring chefs? Walk before run. Take your time. Listen more. Read as much as possible. Set goals, and work your tail off to get them. Taste, taste, taste. What is the key to creating the perfect dish? Great product. Editing. Temperature. Textures. Flavors. Spice. Balance. It is said that food is a common ground that brings people together. As someone who makes food for a living, what does this saying mean to you? Totally agree. You are what you eat, they say. But might as well be who you eat with becomes you too. What are your “5 Things I Wish Someone Told Me Before I Became a Chef” and why? (Please share a story or example for each. I wish someone had told me about the amount of work that it takes. Becoming a chef is a long process, years and years of work, and constantly learning new things. Over that time there are long days and nights, you’re constantly on your feet. You can really only do this work if you have a passion for it, a joy for cooking and feeding people. I knew that it would be tough, but never took the time to look at the total amount of work involved long-term. I’m definitely over Malcom Gladwell’s 10,000 hours. Becoming a chef is a long-term commitment. I wish someone had told me about all of the talent I’d be surrounded by. As a chef, you’re only as good as the people you’re with. Starting out that was my mentors, senseis, teachers, and then later I became the teacher myself, while still learning all the time. I never considered the grand idea of evolving over time from student to teacher. That part is simply amazing and I wouldn’t change it for anything. The coolest thing is when you have talent that you can see growing within the ranks, from cook to chef. The goal for them is to spread their wings and use that talent, and eventually open their own place if they want to. We’ve seen many people do that over the years at Hai. I wish someone had told me that becoming a chef is a process of maturity. It’s been great that for me personally, it’s gone hand in hand with fatherhood. I’ve been raising our three daughters while simultaneously opening new restaurants. Being a mentor at work and being a father at home has worked out so perfectly, I could have never imagined. It’s amazing to watch people change, you can see a little bit day by day but looking back years, it’s amazing to see where people were then versus where they are today. A toddler to a teenager, a cook to a chef, it’s awesome to be a part of that growth. I wish that someone had told me about the potential for success. When we started out with Uchi 15 years ago, I just wanted to be creative and have the freedom to make the food I wanted. Growing the food and culture of Uchi beyond that one restaurant has been incredible. We’ve been able to take people’s talents and passions and grow into seven restaurants, including one out of state. I never thought we’d have more than just Uchi! I never even considered the possibility. I still can’t believe it. It’s all about the people. There wouldn’t be seven restaurants with just me, it takes a village. To love people and trust God. To be anxious for nothing, and the more you can get out of your mind about yourself, and instead focus on others… the whole playing field changes. Some of the biggest names in Business, VC funding, Sports, and Entertainment read this column. Is there a person in the world, or in the US whom you would love to cook for and why?